Sometimes folk will say being fast is all about having fast rolling bearings. While this is not true, it’s still important to keep your bearings rolling like they’re supposed to. With time bearing will collect dust and other contaminants, their lubricant will dry and they’ll be noticeably slower. Bearings can last years, there’s really no need to be spending too much money on them. You’ve probably seen brands that try to sell you “ceramic”, “swiss”, “performance” or other buzz words, skip this, cheap bearings are good enough. So long as you keep them clean and take care of them, cheap end bearings will last you just as long as expensive ones; they might not roll as smooth at first but most bearings have a breaking in phase, after that they’ll roll as good as any bearing. To help bearings last longer, always use speed rings and spacers – not only will the feel much better but it will keep them from being damaged from lateral forces the wheels exert on it. You’re going to want to select which bearings to clean, make sure they’re actually worth the cleaning process. Roll your wheels around; if they make nasty sounds or barely roll, the bearings probably need a bath. That cool hissing sound bearings make is also a no-no, it means they’re dry and you should probably put some lube in them before they actually get damaged. A clean, lubed bearing should not make any noise. From this list there’s two things you should be careful with: the lube and the cleaner. Some people will use rubbing alcohol or paint thinner to clean bearings, do not use them. Citrus cleaner is a less harmful alternative that will do the job just as well, and it can be reused by just filtering it through a coffee filter. For lube, it’s very important that you use thin lube. Stay away from wd-40, motor grease, 3 in 1 or other thick lubes, they will ruin your bearings. 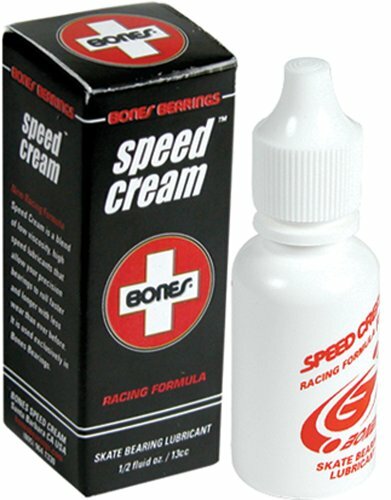 Order some bearing lube online from actual skate brands like bones or zealous, or you can use electronic or sewing machine lubricants. First step to cleaning your bearings will be taking them off your wheels. Simply rotate your wheel around the axle to snap them off. There are two kinds of bearings you’ll want to differentiate – those whose shield can be taken off and whose can’t. Most bearings with rubber shield should be able to take the shield off without any problem. Metal shield are a bit more of a problem – there’s the ones with c-rings, their shields can be easily taken off by removing the ring and there are the ones completely sealed off. For bearings whose shields you can’t take off we’ll skip a few steps. Pop off the shields … if you can. Clean the shields around with a towel. Do not pop the retainer off. Fill your bottle up with some citrus cleaner – don’t put in too much, a quarter of the way up should be more than enough. Throw in your dirty bearings and shake it. Don’t be too harsh with them, but make sure you clean them thoroughly. Five minutes of shaking them around should be enough. This is the part you’ll want to skip if you couldn’t take your shields off. Rinse the bearings out with water and immediately dry them with a towel, use the drier or dust remover to dry off excess water – roll them around while doing this to make sure they are completely dried. 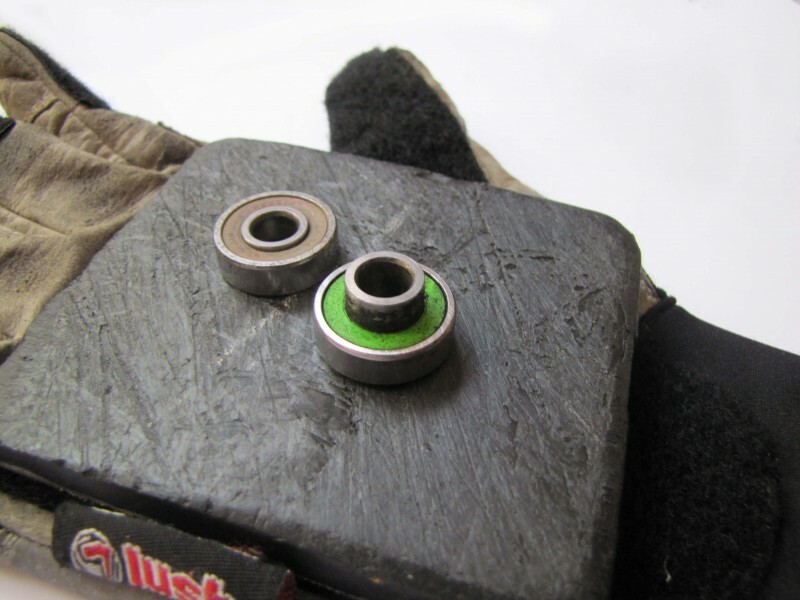 Water can cause your bearings to rust; this is why you’ll want to be fast drying them out. If you couldn’t pop your shields off, it’s better if you don’t rinse the cleaner out with water, it could stay there and get the shields or balls to rust. Instead, go ahead and dry them with a towel and use the dust remover or the drier on cool to dry them off. Your bearing should now be perfectly clean; all you need is some lube. Get your skate lube or whatever lube you’re going to use and drop two or three drops in each bearing. Some lube bottles will come with a hypodermic needle, this is great for getting the lube right where it needs to be, in-between the balls and the guides. Roll them around so the lube spreads evenly. You can now put your shields back on. Finally, pop your now clean bearings in your wheels and enjoy. As a final note I’ll like to talk about the ABEC scale. ABEC ratings refer to the tolerance used when making the bearings; it has absolutely nothing to do with how good a bearing is. Machines are not perfect and it’s impossible to get something be exactly what it needs to be, there’s always some error. That error is not noticeable to us; ABEC 1 bearings can only be off their original specs by 0.0075 mm – that’s incredibly small – ABEC 7 can only be off by 0.0025 mm. We call those errors tolerances, how much error we can tolerate in the construction since it can’t be perfect. The ABEC scale goes from 1 to 9, skipping even numbers. ABEC 10 would be the theoretical perfect, and we know that’s impossible; so know that when brands try to sell you anything higher than 9 they’re trying to sell you a gimmick. ABEC ratings don’t matter as much as people think, stay away from ABEC 1 and 3 since they typically mean subpar construction, but other than that everything is fair game. Bones doesn’t believe in ABEC rating so they don’t try to market their bearings with it. Other companies like zealous don’t really care for it so they don’t advertise it, but it’s written on the shields (they’re ABEC 7). If I were to write a guide on how to select bearings I could sum it up in one sentence: if it rolls and fits, it’s good. I can’t stress enough how unnecessary it is to spend too much money on bearings. Stay in the $20 range. Take care of your gear; it’s what’s keeping you from eating it on the road. As always, be safe out there, take things easy and enjoy yourself skating.